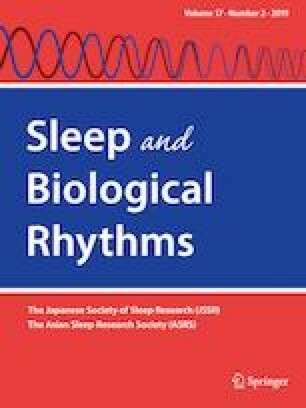 This is the first editorial in Sleep and Biological Rhythms. As the first topic, we have chosen to describe a study of a Japanese birth cohort. Beginning in 2011, the Ministry of the Environment has conducted the Japan Environment and Children’s Study (JECS), a large-scale nationwide epidemiological cohort study involving 100,000 mother–child pairs living throughout Japan . The JECS has published 45 reports, including two on sleep . One was on sleep duration and sleep quality before and during pregnancy . The report showed that the younger the pregnant women were, the more sleep difficulties they experienced; also the younger pregnant women felt more sleep-deprived despite having had enough sleep time during pregnancy. The other published study was on mothers’ sleep and their infants’ birth weight . Findings showed no association between the amount or quality of mothers’ sleep and the risk of small-for-gestational-age birth weights among their infants. Sleep disorders such as sleep-disordered breathing, restless legs syndrome, and periodic limb movement disorders  are known to be prevalent during pregnancy. It is very difficult to monitor sleep with polysomnography or without center sleep testing to detect sleep-disordered breathing or periodic limb movement during sleep in large epidemiological settings. Further sleep studies of women during pregnancy may be needed both in epidemiological and clinical settings.